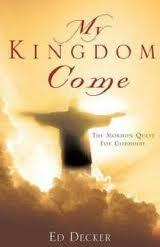 A few years ago my good friend Ed Decker called and asked me to help him out with a book he was writing at the time called “My Kingdom Come”. The book deals with many issues within Mormonism, but the chapter I contributed to was on my experience living as a “residual fruit” of polygamy. I shared in his book what it was like growing up with so many relatives and what it does to someone spiritually, mentally and emotionally knowing your sole purpose in life was to bear children for the Mormon god.